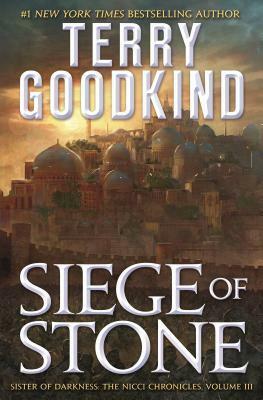 The ramifications of Shroud of Eternity extend throughout all of the Old World as familiar allies, dangerous magic, and creatures created by twisted sorcery all work at cross purposes to either save or destroy Ildakar in Terry Goodkind's Seige of Stone The Sorceress Nicci, the Wizard Nathan Rahl, and the young swordsman Bannon remain in the legendary city of Ildakar after a great internal revolt has freed the slaves and brought down the powerful wizards council. But as he fled the city, capricious Wizard Commander Maxim dissolved the petrification spell that had turned to stone the invading army of General Utros fifteen centuries earlier. Now, hundreds of thousands of half-stone soldiers from the ancient past have awakened, led by one of the greatest enemy commanders in history.Nicci, Nathan, and Bannon have to help Ildakar survive this unbreakable siege, using all the magical defenses of the legendary city. Even as General Utros holds Ildakar hostage and also unleashes his incredible army on the unsuspecting Old World, an equally powerful threat arises out in the sea.Nicci knows the battle won't remain in the city; if she can't stop this threat, two invincible armies can sweep across the Old World and destroy D'Hara itself. My rating system. * Probably didn't finish and I finish 99% of the books I start. ** Not a fan. I finished just on principle. *** Pretty good and worth the read. **** Above average. If there is a sequel I will read it. ***** Created a good memory, very informative and I may actually read it again one day. To be totally fair to this book, I have not read the first two in the series. It took me a bit longer to fall into this book because of it. I have read the Sword of Truth series though, so I was at least familiar with Nicci and the world itself. That said, i still liked this book a lot. I will go back and read books one and two as soon as my TBR pile allows it, and I'll probably revise this review at that time. I wouldnt recommend starting this book if you have not read any of the previous books To be totally fair to this book, I have not read the first two in the series. It took me a bit longer to fall into this book because of it. I have read the Sword of Truth series though, so I was at least familiar with Nicci and the world itself. That said, i still liked this book a lot. I will go back and read books one and two as soon as my TBR pile allows it, and I'll probably revise this review at that time. I wouldnt recommend starting this book if you have not read any of the previous books in this world. I do recommend it if you are a Sword of Truth fan!